This is a collection of clean, crisp and cool calendar routines which will baffle and startle your audience. They can live in your wallet or pocket and are ready for anytime and anywhere performance. There is nothing to memorize and no complex math. All the systems are easy and self working. You will be able to start doing these within 15 minutes of reading the instructions. The routines are as follows. 1. Roman Enigma - The performer claims to have photographed an ancient rock engraved inscription from recent secret Roman excavations which gives him the weird and inexplicable power to know instantly the day of any date of some special years including the current year. 2. Torn and Restored - The performer displays a torn piece of what appears to be an old calendar but the few dates appearing on it seem weird. But mysteriously the performer is able to psychically restore the other days of the calendar by intuitively knowing their weekdays. 3. Coloracle - The performer displays a vibgyor based color oracle system which mysteriously but accurately predicts the related future of a secretly thought of past and present choices. Very direct, startling and lot of fun. 4. 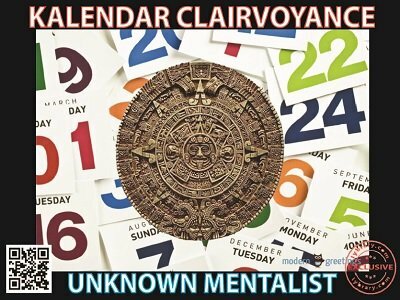 Mayan Mystery - The performer displays an ancient Mayan calendar which has only 9 months corresponding to the 9 planets and each month having 42 days including some invisible days to total 365 days in a year. This 42 day calendar also proves to be an accurate oracle. 5. Blind Date 1 - From the participant's perspective, she merely thinks of a year and gives a random date and yet, the performer divines the exact day of the week of that date, almost instantly. 6. Blind Date 2 - A participant merely thinks of a year and secretly writes any date and yet, the performer is able to divine the exact day of the week for that date, almost instantly. Also, additional phases, extra ideas and alternative handlings are included.